The Ganga River, often referred to as the anglicized Ganges in the west, is a major watershed of the Indian Continent, with its origin in the Himalayan Mountains at Mount Kailasa, to its drainage at the Indian Ocean (Darian 1). The Ganga is formed near the town of Deoprayag where the Alakananda River joins with the Bhagirathi River, which has its source at Gangotri Glacier (Darian 7-9). The ice cave Gaumukh in the Uttaranchal state of India, close to the Gangotri Glacier, is a well known bathing source in the waterway (Backshall 1). There are many important tributaries as well as geographical sites such as Vasudhara Falls and Lake Manasarovar that are attributed to the Ganga River. Lake Manasarovar is the highest freshwater lake in the world and is a site of religious pilgrimage. It is believed that Lake Manasarovar is the summer refuge for swans, a wise and sacred animal. In the foothills of the Himalayan mountains is Hardwar, known as Gangadvara, “Door of the Ganges” which marks the rivers geographic entrance into the North Indian Plains (Eck 1996:137). Another notable landmark is Prayag where the formerly parallel flowing Yamuna that originates near the Bhagirathi and the underground mystical Sarasvati River also join the Ganga (Eck 1996:137). The Sarasvati is a mystical river mentioned in the Rg Veda which is tied to the Ganga (Darian 58). The location of the Sarasvati is unknown, and post-Vedic Hindu literature does not detail its disappearance. Descriptions of the Sarasvati from the Rg Veda have been applied to the Ganga (Darian 58-68). Near the mouth of the Ganga is the island of Sagar, considered sacred, and which is believed to be the entrance to the netherworlds (Eck 1996:145). The Ganga is referred to by different names including “Child of the Mountains” and the “River of Heaven” (Eck 1982:74,211). In Hindu tradition, the Ganga is regarded as a goddess and is thus known as Ganga Mata, or “Mother Ganges” (Eck 1996:136). The Ganga embodies the sacred geography of India as she is the essential hub of India’s development, civilization and religious culture. The Ganga’s descent to earth is known as her avatarana, and her revered descent marks the return of life-giving water for cultivation of many of India’s primary resources (Eck 1996:137). Furthermore, the Ganga is worshipped as the embodiment of female energy known as sakti, and is also sacred for her mothering capacities (Eck 1982:72). Although Hindu goddesses often have an ambivalent nature, being both nurturing and destructive, the Ganga is worshipped primarily for the nourishment she provides while her potentially destructive nature is mostly overlooked. The entire length of the Ganga is considered sacred and is scattered with many auspicious crossings known as tirthas, which are the objectives of many pilgrimages (Eck 1996:137). In iconographic representation, the goddess Ganga is mostly depicted as a women atop her mount (vahana), a makara or crocodile. She holds a kumbha, the vase of plenty (Darian 114). The makara is an ambivalent creature. It may be regarded as an animal form of the God Soma, and is an emblem for the waters, plants and vegetal layer of life (Darian 114-115). However, the makara is also a symbol of the unknown ocean and an object of fear (Darian 114-115). There are many myths about the Ganga, who is considered consort to both Siva and Visnu (Eck 1996:137). In the mythology of the Devi Bhagavata and Brahmavaivarta Puranas, Ganga quarrels with Sarasvati, the other consort of Visnu, and both curse one another to become rivers. For this behavior, Visnu allows Ganga to become wife of Siva, who breaks her mighty torrent through his hair (Eck 1996:146). 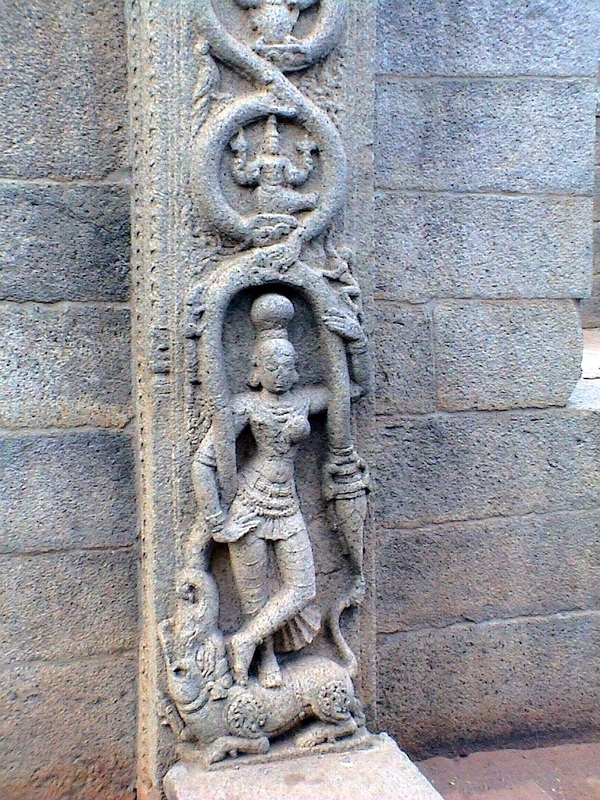 Siva, also known as Gangadhara, “Bearer of the Ganges,” is the companion of Ganga and they are often depicted in sculptures together as bride and groom (Eck 1996:147). This intimate union between Siva and Ganga often angers the other consort of Siva, Parvati, which causes great jealousy (Eck 1982:219). The Ramayana, Mahabharata, and other Hindu literature describe the myth of Ganga falling from heaven to revive the sixty thousand sons of King Sagara. Flowing from Siva’s hair and being caught by Bhagiratha led her to become the purifying water for Sagara’s sons (Eck 1996:145). The festival of Ganga Dashara is celebrated on the tenth day of the month of Jyestha, when monsoon rains signal the descent of the Ganga from heaven to earth (Eck 1996:143). The Ganga Dashara is regarded as the birthday of the Ganga and bathing in the water is believed to destroy sins of ten lifetimes (Eck 1996:143-144). In one Vedic myth, Indra combats the serpent Vrtra that has trapped the celestial waters and by defeating Vrtra releases the sacred Ganga waters (Eck 1996:143). Water has been an important symbol of spirituality in India since the beginnings of the Indus Valley Civilization (2500 to 1500 BCE) (Darian 15). Ganga water is used in many ceremonies including daily rituals, death rituals, weddings and births. The sacred thread ceremony (upanayana) in Bengal requires the participant to consume only bread and Ganga water (Darian 14). The Ganga is considered to be flowing in three worlds; heaven, earth, and the netherworlds, often referred to us triloka-patha-gamini (Eck 1996:145). This has become important in death rites, as the Ganga is a place of crossing from the world of living to the dead. Cremated remains arrive daily in the city of Banaras where they are immersed in the Ganga, as those sanctified by Ganga water will reside in heaven (Parry 24). Furthermore, ritual cleansing has been historically important to Hindus, as shown by the archeological remains of ceremonial cleansing tanks at Mohenjo Daro and other sites (Eck 1982:217). The Ganga waters are considered to be purifying and an absorber of pollution. They naturally serve as an abundant and accessible source of sanctifying flowing waters for a wide variety of Hindu ritual activities. The name Ganga is derived from the verb gam meaning “to go” which emphasizes the energetic, flowing nature of the water (Eck 1996:144). As the water absorbs the pollution, it is believed to also carry it away, thus erasing sins of lifetimes in “an instant!” (Eck 1996:144). Many pieces of Hindu literature such as the Rg Veda and epics, praise the Ganga. Merely chanting the name of the Ganga is believed to relieve poverty, bad dreams and even protect from the inauspiciousness of being bespattered by crow feces (Eck 1996:138). Pilgrims often make offerings of flowers to the Ganga while calling out “Victory to Mother Ganges!” Hindus frequent pilgrimage sites (tirthas) all along the course of the Ganga. They bathe in its waters, and even use the water to make offerings (Eck 1996:138). Ganga water is also collected and taken to homes and temples for other rituals (Eck 1996:138). The Ganga is more than a single river. In Hindu belief, it is a representation of all of India’s sacred waters, and thus aptly demonstrates the cultural significance of water (Eck 1996:139). Since the Ganga’s waters are not accessible to all Hindus, especially those in the diaspora (i.e. outside India), other waters are substituted and transformed into the sacred fluid, merely by adding drops of Ganga water to them, or by uttering mantras of praise to the Ganga (Eck 196:138). This capacity for transformation is not restricted to the Ganga. There are said to be seven rivers that may be used as a sacred water source and hold the same sanctity, including the Ganga, Yamuna, Godavari, Sarasvati, Narmada, Sindu and Kaveri (Eck 1996:138). However, the Ganga is regarded by pious Hindus as the foundation of all rivers and, therefore, visiting any river in India, or the world, with reverence, is considered to be akin to visiting the Ganga itself ( Eck 1996:138). Backshall, Stephen (2004) Birth of a River. National Geographic Traveler. Vol 21 (8). Darian, Steven G. (1978) The Ganges in Myth and History. Delhi: Motilal Banarsidass. Eck, Diana L. (1996) Devi: Goddesses of India. Berkeley: University of California Press, Ltd.
Eck, Diana L. (1982) Banaras City of Light. Princeton: Princeton University Press. Fuller, C.J. (2004) The Camphor Flame: Popular Hinduism and Society in India. Princeton: Princeton University Press. Parry, Jonathan P. (1994) Death in Banaras. Cambridge: Cambridge University Press. Article written by Allie Becker (April 2008) who is solely responsible for its content.